We offer unparalleled industry expertise through subject-matter specialists who have spent their careers in distribution and wholesaling. Consumers have taken control of the microphone and are calling for the food and beverages they want, when and how they want them. This is changing everything in the food distribution business. Why? Because now consumers can, and frequently do, make incredibly informed decisions about what they eat. They do this simply by consulting the technology they carry in their hand. 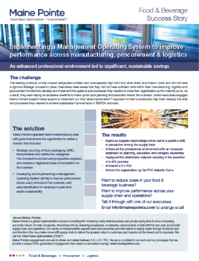 This instant access to information is changing the way large consumer packaged goods companies target their customers. Companies that have historically utilized marketing, couponing, promoting and sampling to entice customers to purchase, now face close and critical scrutiny from tech savvy consumers. At the same time, consumers have changed their purchasing habits. Many people now choose smaller brands whose “authentic story” and “transparent supply chain” give them confidence that the products they are buying are better for them and their family. As a consequence, the large-scale brands are battling against 100s of small disruptions that are gnawing away at their market share. At Maine Pointe, we have worked with many of the top ten food distributors and wholesalers, as well as large and small CPG companies, and have mapped out a better route to stay close to today’s consumer. 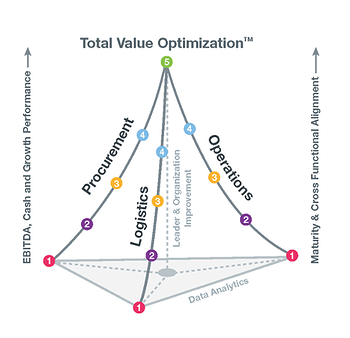 Our results-driven Total Value Optimization™ approach helps companies see clearly from one end to the other of their value chain. This enables them to unlock the value in each function of the business and leverage it across their organization to provide the leadership alignment, process integration and information visibility that help drive cost out and pull intelligence in. Focusing holistically on the critical interdependencies of procurement, logistics, operations and planning functions, TVO aligns and integrates people, processes and data analytics across functional silos to deliver the best value to customers at the lowest cost to business. We offer unparalleled industry expertise through subject-matter specialists who have spent their careers in distribution and wholesaling. Bringing together the most experienced resources is one thing, challenging our clients to think differently and to implement those thoughts is another thing altogether. To succeed, leadership needs to align limited resources, break down departmental silos and engender a culture in which every team member understands exactly how their own activities contribute to the organization’s broader strategic goals. Maine Pointe helps its clients to develop these capabilities and to implement new processes and tools within a sustainable, healthy organization. That’s why our clients succeed and why Maine Pointe is a strong partner.